This week's film noir is The Maltese Falcon (1941). 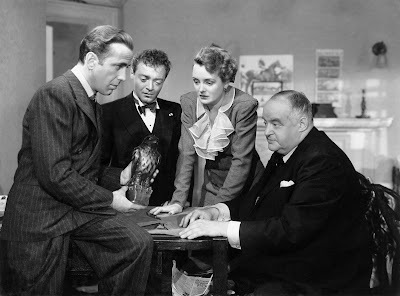 Here's Humphrey Bogart, Peter Lorre, Mary Astor, and Sydney Greenstreet ogling the black bird. Director John Huston's classic The Maltese Falcon (1941) is one of the earliest and best films noir. Film noir was a popular genre of American movies in the 1940s and 1950s known for its shadowy black and white visuals and complex plots about crime and betrayal. Film noirs came out of the gangster and horror films made by Hollywood in the early 1930s and the German Expressionism movies of the 1920s and 1930s. There were a few films noir in the 1930s and early 1940s -- TCM will air Friday the classics M (1931) and Stranger on the Third Floor (1940) starring Falcon alum Peter Lorre -- but 1941 saw the first real flowering of film noir, beginning with The Maltese Falcon and another Humphrey Bogart vehicle, High Sierra. The Maltese Falcon features Bogart as world-weary detective Sam Spade. He is led on a merry chase for a priceless jewel bird by a cast of characters whose personas would come to define the film noir genre: Mary Astor as manipulative femme fatale, Brigid O'Shaugnessy; Sydney Greenstreet as giggling crime boss Kaspar "The Fat Man" Gutman; Lorre as gardenia-scented stool pigeon Joel Cairo, and Elisha Cook Jr. as menacing heavy Wilmer Cook who shoots first and asks questions later. TCM will air The Maltese Falcon at 2:30 p.m. tomorrow (June 5) as part of its Summer of Darkness, which will feature a day-long marathon of the best films noir every Friday in June and July. Below, I'll give a rundown of the noir elements of The Maltese Falcon to get you ready for a day of darkness. Low-key lighting: Shadows and night cinematography are hallmarks of film noir. Sam Spade doesn't exactly keep banker's hours, so Huston and director of photography Arthur Edeson use many night scenes to evoke the foggy San Francisco locale and the shadowy underworld of Brigid and her partners in crime. Here's a beautifully photographed scene with Cairo fishing for information in Spade's office. Camera angles: Another hallmark of film noir is distinctive camera angles that heighten the tension and mood of a movie. Director Orson Welles and cinematographer Gregg Toland pioneered many of these techniques in Citizen Kane (1941), but Huston also moved the camera quite a bit in The Maltese Falcon. In this scene where Spade visits Gutman's hotel room, Huston uses a low angle shot to emphasize both The Fat Man's girth and his menace (clip below). The world-weary hero: Until 1941, Bogart was mostly a supporting player at Warner Brothers, appearing in thankless villain roles opposite big stars like Leslie Howard and James Cagney, but, when Bogie put on Spade's trench coat and fedora, he became an American icon. Spade became the archetypal film noir hero and Bogart played variations on this persona again and again in films like Casablanca (1943), The Big Sleep (1946), and In a Lonely Place (1950). The still portrait of Peter Lorre, Mary Astor, and Humphrey Bogart in The Maltese Falcon (1941). The femme fatale: Astor's performance as the wily Brigid O'Shaughnessy is just as iconic as Bogart's turn as the ultimate private eye. Astor created the archetype for the femme fatale with one key difference. Later film noir heroines would be more overtly vampy -- think Lauren Bacall or Veronica Lake -- but Astor is quite prim and proper while she's leading everyone down the garden path. Astor mostly played high-society ladies and mothers in her long career and her portrayal of Astor is very much in keeping with those roles. Brigid wear matronly dresses and has a wide-eyed demeanor, but she didn't learn her devious behavior in Sunday School. Dialogue: Unlike many films noir, The Maltese Falcon has a linear narrative, meaning the story unfolds from beginning to end. Instead of using flashbacks to add complexity to the plot, Huston, who wrote the brilliant screenplay, uses dialogue. There are so many double crosses and triple crosses that it becomes extremely disorienting for the audience and even the characters. Brigid tells so many fake stories that even she can't remember which lie she just told. 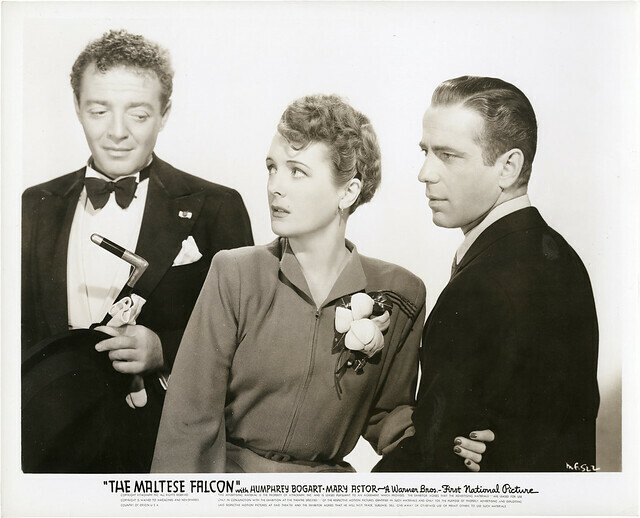 The Maltese Falcon is available on DVD and video on demand. You're welcome. Thanks for reading and your kind words.